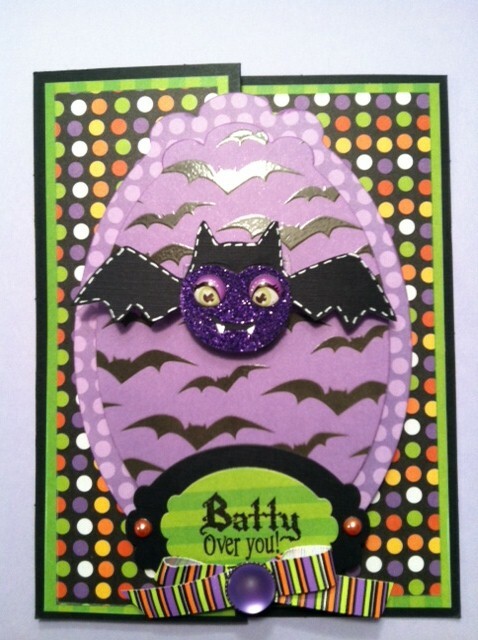 Craftin Desert Divas Blog: Batty Over You! Can you believe were already in October? Before you know it Halloween will be here. My girls will be off for Fall break next week. That means a little R&R in Mexico, can't wait! Since I'll be gone for a few days next week thought I would try to join a few extra challenges this week. There are lots of fun Halloween ones, so this is the card I decided to make. I just love the new CAC2 cartridge. I knew I wanted to make this bat as soon as I was looking through the manual. I just love to do "S" fold cards. I think they're so simple and they come together super quick. 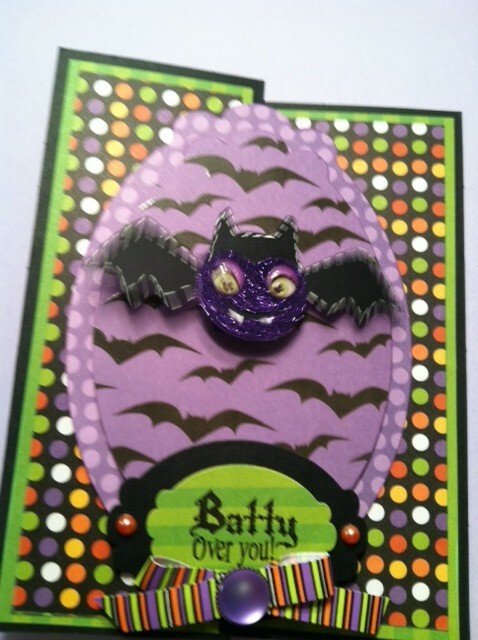 I bought some new Spellbinders Nestabilities Labels 10, so I used them to cut out the shape to put the bat on. It makes it so simple. Of course I had to add an action wobble to the bat. My daughters just love them! If it was up to them they would be on every card I make. Make sure you entered our $100. Joann's giftcard giveaway. 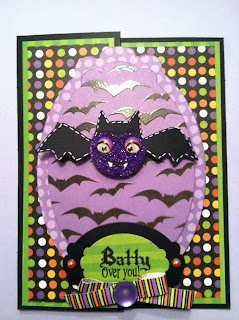 My crafty friend Janis over at Pause Dream Enjoy is also having a Halloween giveaway! Make sure to visit her and enter. Thank you so much for stopping and taking a look. Make it a great day. I also wanted to share these two cards my daughter Alivia who's 9 made. When I was making the bat card my first bat was too small, she did the glittering and doodling on the bat and did a great job on it. I also made the lollipop on the other card, but she made the spider out of pom pom's. Alivia is very creative. As you can tell lots of my scraps or mess ups are put to good use. Me sharing their projects on my blog makes their day!! So adorable! I love Halloween creations and this one is fabulous! Hehe!!! Love it!!! Awesome papers and I love that bat! Ha! Love this batty bat! Really cute card!! SUPER cute card! 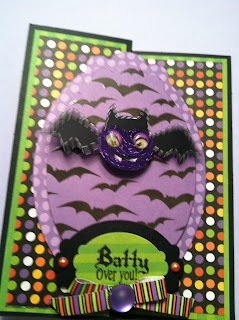 I love the fun colors and that the bats on an action wobble! Your daughters card are fabulous too! Thanks for playing at My Craft Spot! How very clever! Love your wobbly bat and your daughter's pom-pom spider! 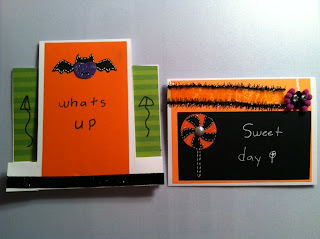 Thanks so much for sharing your Halloween creations at Party Time Tuesdays this week! I love your card!! So very "spooky". I love your blogspot too, purple is my favorite color. I will come back here frequently. super cute.love the wobble with sentiment.I have a sentiment very alike i have to find now that i have seen your card.My son too loves the action wobbles. 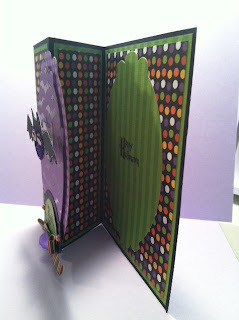 Alivna you made some Fab cards.Love the 3d card with the sentiment.Your cards put a smile on my face. Love all three cards! You and your daughter really did an awesome job. So Cute. I love how freaky the bat looks awesome job ladies. Thanks for joining us over at Action Wobble Challenge. I love the sparkly bat!! I don't do enough S fold cards and they look so fabulous!! What a fun card!! And wow, Alivia's cards are so awesome...she did a great job!! Super fun! Great design and love the paper! Great work ALIVIA! This card is so cute!! I love all the details like the fold and the action wobble, so fun! Thanks for playing at My Craft Spot. Love the blog to! The falling candy and bats is great! SO cute, I really like the style of card you used with the bat image! !